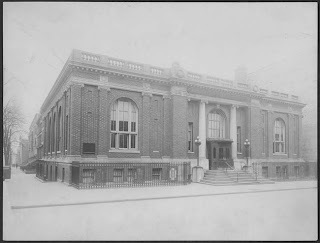 The Carroll Park Branch begun in 1901 in rented quarters at Smith and Carroll Street, and then moved its current location at Clinton and Union in 1905. 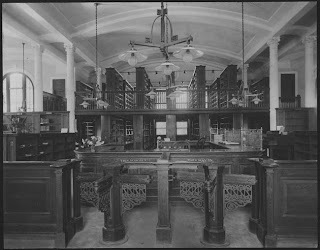 The newPress clippings describing the opening ceremony, the fifth Carnegie Branch built in Brooklyn, “a model one in every respect, large, airy, well-lighted and perfectly equipped.” The spacious, 14,000 plus square foot interior has the original dramatic barrel-vaulted ceiling supported by columns and some of the original details. Designed in the Beaux-Art Classicism style by the architect William B. Tubby (1858-1944), it is a modest structure with classical lines built of Harvard brick and limestone, and features Ionic columns, pediment, arches, roof balustrade, pilasters, and dentilated cornice. It nonetheless has a kind of monumentality and stately presence in its Carroll Gardens neighborhood setting. The builder was John Thatcher & Son, who also built the Flatbush Carnegie Branch for R.L. Daus, Architect. Tubby was among the top Brooklyn architects, born in Iowa, Tubby came to Brooklyn to attend Brooklyn Friends School and then Polytechnic Institute, following which he went to work for Ebenezer Roberts, architect of Charles Pratt’s house on Clinton Avenue. Tubby succeeded to the Roberts practice and designed some of the most distinctive Brooklyn buildings of the 1880s and 1890s, including the Queen Anne row houses at 864 to 872 Carroll Street (1887) in Park Slope, the row houses at 262 to 272 Hicks Street (1887-88) in Brooklyn Heights, the Charles Adolph Millard Pratt house (1890-93) on Clinton Avenue, and the 20th Precinct Police Station House (1894-95) on Wilson Avenue in Bushwick. The Carroll Gardens Branch has always served the large Italian-American community. In 1907, the Brooklyn Eagle reported that free lectures were given in Italian every Sunday evening. In the 1930s, Carroll Gardens was famous for its citizenship classes and services, and through the National League of American Citizenship helped over 10,000 people secure their citizenship pagers. Its 1933 annual report notes, “there isn’t any place like this where aliens can be helped. There isn’t any other place with the knowledge and patience to care for them.” Mrs. Vincent Astor was the chairman of the advisory council of the League at the time. Today, Italian-Americans are joined by a diverse population that includes Latinos and African-Americans. In 1973, the branch closed for renovations. When it reopened, the building had been completely air-conditioned and repainted; a list of new features included, new electrical service, lighting, flooring, and a new roof. It was renamed Carroll Gardens, a change requested by the community. In addition to its regular services, the branch also conducts programs for children and adults. In 2005, the library under went a $1.5 million renovations to make the branch wheelchair accessible. The project, completed in spring 2006, included painting the auditorium, widening of the Union Street entrance, new wheelchair ramps, a wheelchair-accessible restroom, and a new elevator to the main reading floor, balcony and basement levels. An active Friends group supports the branch. Telephone number is (718) 596-6972. Branch information and library hours. I appreciate the post-reno air conditioning, but the original interior was much more beautiful! Yes, the a/c is great- but why can't we redo w/some taste? Too much function and no style. We have revived the Friends group, and hope to raise the bar on things a bit. Come down and join us, Ms. B!